Arriving in Alsace by way of Champagne is the way to go. The route heading east takes you over the infamous Vosges Mountain range to a lush valley, more Germanic than French, where Riesling reins supreme. The Alsatian valley is a long and narrow one, dotted with historical villages, each with a steeple peaking through the red-tiled roofs and brightly coloured buildings of yellow, turquoise and red all decorated with bogenvelia spilling from every window sill. It’s not hard to imagine Hansel and Gretel skipping around the corner hand-in-hand. 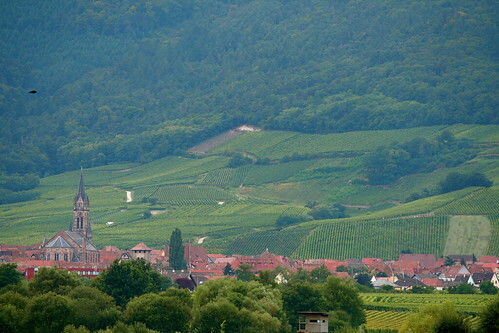 Alsace is renowned for its production of single noble grape varieties vinified to preserve the freshness and purity of the fruit and the minerality of the soils, packaged in elegant flûted bottles. Typically dry to off-dry, there are also two other classifications of Alsatian wines depending upon the ripeness of the grape: the sweeter styles of Vendange Tardive (Late Harvest) and the botrytis-affected Selection de Grains Nobles. The top examples of Alsatian wines have the ability to age for decades. Organic and biodynamic vinification and minimal intervention winemaking is the status quo for this region. 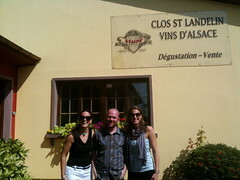 On our inaugural visit to Alsace, Tracey and I were honoured to have been welcomed into four prestigious domaines. This is clearly a family-driven winery as we were welcomed into the tasting room by René Muré himself, the 11th generation of the business, our purchases of the day were delivered to our car by his son Thomas, and our subsequent correspondences have been with his daughter Véronique. The nurturing and care given by the family to the vines, which surround the domaine, is evident in the glass. 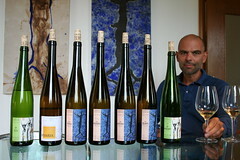 Common among many Alsatian winemakers, René Muré produces the full range of varietals and styles of the region. The front gates of the modest Ostertag Domaine open to a tranquil backyard lined with well-tended, biodynamically farmed vines. André classifies his wines into 3 categories, according to the expression of the unique terroirs: ‘Vins de Fruit’ wines emphasize the purity of the fruit, ‘Vins de Pierre’ expresses the soils and ‘Vin de Temps’ includes the wines that have the greatest longevity. The captivating labelling is another personal touch to the wines, as each bottle is adorned with the original artwork of André’s wife. André’s gentle nature revealed itself during a stroll trough his pet project: a small plot of vines that he planted in a yin yang formation above his cellar. It must be said that all 3 styles embody the passion, intensity and austerity of the winemaker himself. The wines produced by this family are of outstanding quality as each exhibits the power, character and elegance of the women behind the Domaine. The winery and family home are one, located in the middle of the walled Grand Cru Clos des Capucins. This experience blew our mind. From being greeted at the door by the family monarch, Colette Faller, to tasting 19 unique wines with the stunning and sophisticated Catherine, at the dining room table while Mother prepared the morning breakfast in the adjacent kitchen. Where else in the world would you taste top flight Rieslings to the crackle of bacon and eggs? We reluctantly parted ways, knowing that we will soon meet again, as Catherine hand packaged our order including a few gifts from the house. The experience was exquisite. Maison Trimbach is a big player from the region, as evidenced by the company with whom we shared the extensive tasting: top buyers from around the world. Led by the young and graceful Anne Trimbach, who commanded the room with ease and charm, we tasted the range of the Trimbach portfolio including back vintage examples of their prestige and collection wines. The wines, especially the Cuvée Frédéric Emile and the domaine’s top wine, Clos Sainte Hune, are benchmark examples of Alsatian Rieslings. We wrapped up our day with a tour through the winery which houses both traditional and modern equipment and the rustic family cellars. Alsatian wines, with their purity, power and broad food pairing abilities, are enough to draw any wine enthusiast to the region. However it is the charm of the villages and the openness of the people with their emphasis on family that will make every visitor a fan, leaving wanting more. Needless to say, as we departed for Burgundy and bid Alsace adieu, our luggage bags were downgraded to being stuffed into the back seat of our Peugeot, making room in the temperate trunk for the copious amount of wines we collected along the route. What else would you want with you as a third passenger on a car ride through France? For some of us, post-Easter week means recovering from the ham, lamb and turkey…the chocolate and the cheese…and, of course, the wine. It may be a time to reflect upon the overindulgence that can happen when you get together with family and friends, especially over a 4-day weekend. Do you just say no to anything other than a leaf of lettuce and a bottle of water or do you turn to the Hare of the Dog? No, I’m not talking about “Critter Wines” with their cute and cuddly animals on the label. I’m talking about Rosé! I know, I know, rosé is getting quite a bit of press these days. There is a reason…it’s really good! All rosé does not come from the sea of insipid pink wine that flooded the market from the 70’s onwards. No sir! Rosé, in its finest expression, is a DRY wine that speaks of the grapes from which it is made and the place from which it comes. It’s a stand-alone and great for sipping, or an easy match for food as it has the fruit-driven and fresh characteristics associated with white wine, and yet, it gains flavour and body from being made by black grapes. Let’s turn to a classic, Tavel. Tavel is located in Southern France, close to Chateauneuf-du-Pape. It is an appellation for Rosé wine only; no white, no red, no bubbly for Tavel, just dry rosé made predominantly from the Grenache and Cinsault grape varieties. It is reported that the Sun King loved it (What, he drank something other than Champagne??? ), as did the Popes of Avignon and Honore de Balzac alike. As none of these fellows are here to give you their tasting notes, you must taste it yourself. I am hugely fond of the flavourful, fruity and supple example found in the 2009 Lafond Tavel (Metrovino , $22 ). FV Tasting Club is on next Thursday at The Law Courts. We have a number of good wineries coming to show their wines and talk about them. With the nice weather we’ll be able to have the patio open too. Visit www.FineVintageLtd.com for more info. Skied on Monday with Max. Got big air in the terrain park. Nobody up the mountain, but excellent snow conditions. Launched our wine school in Toronto today. Speaking to one of the top guys out there about collaborating. Should be good…. Went to Olaf’s place on Tuesday nite. Dozens of videos on Champagne and Bordeaux and Napa coming. 18 months of work… and it all starts on Friday next week on another new website. It is the eve of Easter Weekend…a weekend that holds a variety of meanings for folks, of which I will wisely not dive into. Regardless of said meaning, it is for most, a food weekend. So, why not focus on wine and the bunny, that cute little animal that is, essentially, the mascot of the weekend? My mind has raced with the thought; the turtle has no hope of winning this race! Here in Calgary, we have a few “cool” streets, one of them being 17th Ave SW. For those of us who have worked on the strip in years gone by, we remember fondly the local chocolatier that used to don a bunny outfit and deliver chocolate to local businesses. Imagine a 6’-plus bunny delivering chocolate! Recently, he opened another business and so I thought, “will he do it again” and “what would I want to enjoy if I were to deliver chocolate…in a bunny suit?” I’m going to assume it might be a little hot in there, so I think something light and refreshing, or beer! Indeed, sometimes beer is the best wine! So we’ve finally launched 3 sites – www.winejobscanada.com www.winejobsusa.com and www.winejobscalifornia.com – and the response has been great. Thanks for all your comments. I remember when I was looking for a job it was so hard to find out who was hiring, and what was out there. In the last 6 years we’ve had dozens of people at our schools ask us about getting into the wine industry and how to go about it. So finally, we decided to launch a proper service to fulfill your needs. In Canada, there isn’t a good dedicated service. In the USA, there is. But now there will be two sites, and obviously the plan is for ours to become the preferred site. To do that we have better functionality, videos coming every week with a host of famous vintners in Napa, Bordeaux and Champagne, guest bloggers, and a daily wine news feed so this can become your home page. So tell your friends, post a job, and if you are applying then tell people you saw their ad on our site. Hopefully people will find jobs, employers will find good staff, and we’ll have provided a great service to the trade. When James Cluer, MW, offered me the opportunity to help teach wine to Qatar Airways crew in Doha, my response was “Absolutely…when do I start”. Teaching wine in a desert in the Middle East? The irony was not lost on me. Qatar Airways is a 5-star airline renowned for “dining on the wing”. James has been selecting Qatar’s wine lists for 6 years, during which time they have consistently ranked in the top spots for their on-board offerings in international competitions such as Business Traveller and Cellars in the Sky. With their award-winning list, Qatar Airways decided that the next step was to provide their crew with education in wine so that they could better serve their passengers and showcase their wines. Phase one would involve providing the WSET Foundation course to their crew. I left Vancouver on March 21 on a red eye Air Canada flight. Like any North American traveler, this is not an experience I was looking forward to. To ease the pain I ordered some wine: one of those mini plastic bottles from non-descript varietals. Salt in the wound. In London we changed carriers to a Qatar flight and were seated in Business Class. For starters, the seats are plush and wide and fully recline. A welcome relief from a night spent in an erect seated position. We started the flight with a 1998 Vintage Champagne from Lanson followed by a multi-course meal, each course paired with an outstanding quality wine: Mosel Riesling, white Burgundy, Brunello di Montalcino. The entire crew was so gracious and the service was impeccable. Now this is how to travel! I landed in Doha, the other side of the world, late on March 23, ready for bed. Since my arrival, I have been working hard with James and Lynn Coulthard to get the program up and running. I am currently heading towards the finish line for the WSET Diploma with the big Unit 3: Light Wines of the World exam scheduled for early June. I knew that taking this contract would not only be an amazing learning experience but would provide me with plenty of non-interrupted study time. Plus, it meant working alongside James and Lynn. Lynn is an MW student and wine educator from Vancouver who has a wealth of knowledge and experience in the trade and has been tutoring my Diploma tasting group throughout the past year. I am clearly in good company. So now it’s time to teach wine, get back to my studies and take some time off to experience the Middle East! We Calgarians are a pretty tough bunch. We have to deal with some mighty strange weather – it’s not unusual to have 20+ (that’s Celsius) days in February and -10 (also Celsius) days in August. (The latter is rarer than the former.) This, however, is ridiculous…this has to be the hundredth snowfall warning this year!!! It’s April 14th. Having said that, I am not going to get my car out of the driveway and so will rely on what is in the house. It’s never a bad selection but is sorely lacking in Champagne today. I’m going to try some reverse psychology…a bottle of 2010 La Puerta Torrontes, $12.95 (at Wine Ink). Torrontés is a delicate and aromatic white wine that hails from Argentina. Its aromatics, which are somewhat akin to Gewurztraminer, stem from its heritage, which is a crossing of Mission (the vine that spread through South America and into North America by early vine-toting missionaries) and Muscat of Alexandria. To this end, it is a truly unique Argentinean grape. This example is dry and bright in appearance, nose and palate. Its aromatics are beguiling and its dry, fresh taste is resplendent with citrus and peaches and a touch of soft spice. It is a pure delight. The great thing is…I can just put a bottle in the snow for five minutes and it will be perfectly chilled, then sit back, relax and think about the chilly times to come in August. Home from Qatar. Spent the last day on an ATV in the sand dunes and then camel riding – not your average day… lots of fun with Lynn and Tracey and certainly a change from seeing eachother at BCIT. Qatar is an exciting place with huge development and massive investments in infrastructure. I’m sure Lynn and Tracey will like being there. Anyway, we are launching some new websites this week. Love new projects!